Miantonomoh Class Monitor: Displacement 4,084 Tons, Dimensions, 261 x 59 x 15 feet/79.52 x 18 x 4.52 meters). Armament 1 dual "12/35", 1 dual "10/30", 6 6-pound. Armor, Harvey & NS: 5-13 inch belt, 11.5-13 inch barbettes, 7.5-8 inch turrets, 10 inch CT. Machinery, VTE engines, 4 boilers, 2 shafts, 5,250 hp. Speed, 11 Knots. 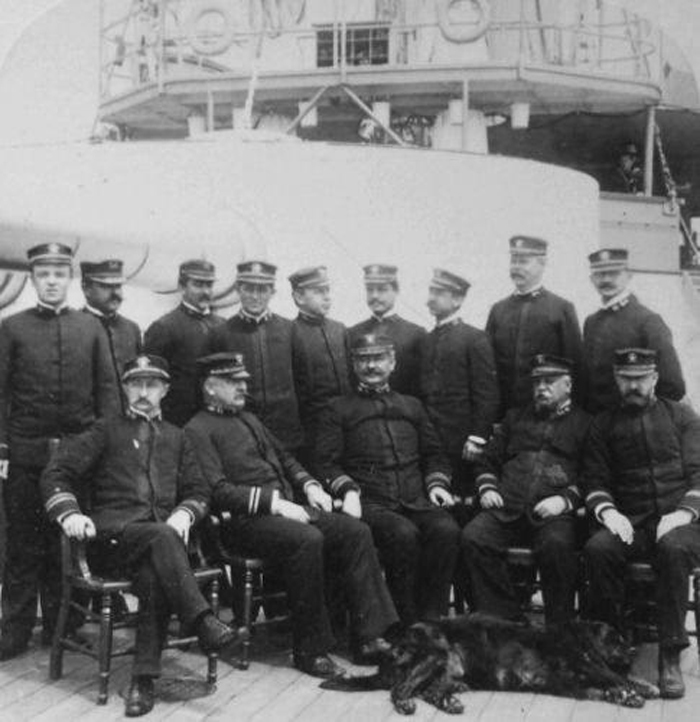 Crew, 190 (218 wartime). Operational and Building Data: Built by Union Iron Works, San Francisco. Laid down 20 December 1889, launched 28 April 1891, commissioned 13 February 1893. 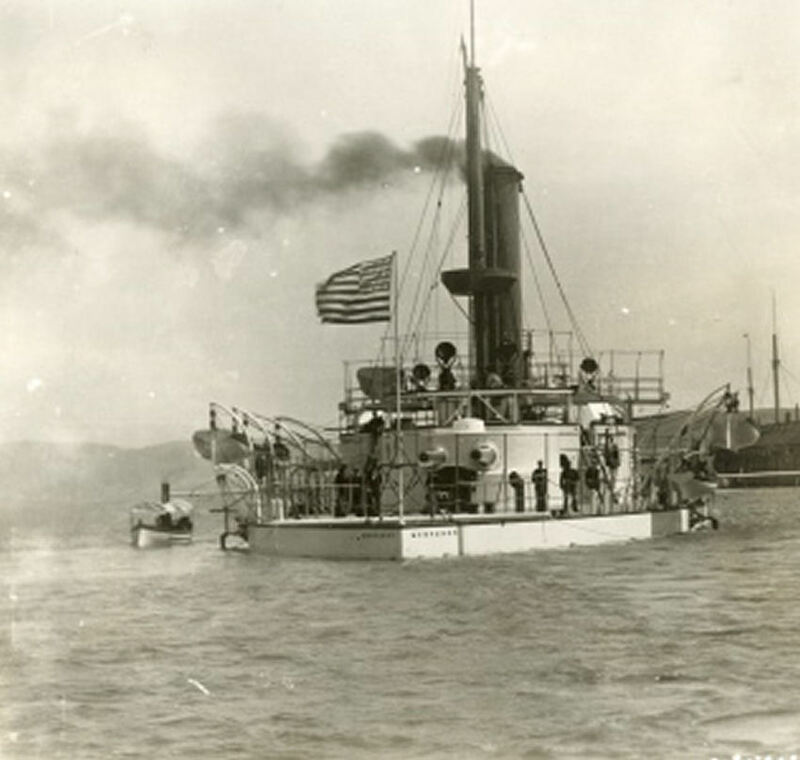 Operated along the west coast, then sent to the Philippines for Spanish-American War service, 1898. Reboilered at Hong Kong, 1900. Served on China Station, primarily at Shanghai, 1900-1903. Decommissioned to reserve in the Philippines 15 December 1904. Recommissioned to commissioned reserve 28 September 1907; decommissioned to reserve 7 May 1908 but was again placed in commissioned reserve. 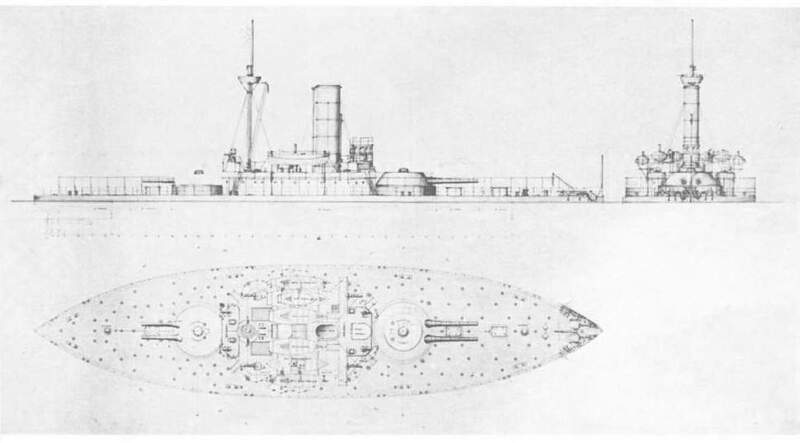 Recommissioned to full commission 9 November 1911 and served on China Station through 1913. Decommissioned to reserve 11 February 1913; recommissioned for WWI service mid-1914 but remained mostly inactive. Towed to Pearl Harbor 1917 and served as station ship and submarine tender at Pearl Harbor until decommissioned for disposal 27 August 1921. Fate: Designation BM 6 assigned 17 July 1920. Sold 25 February 1922; towed to California and scrapped. 434k Monterey (BM-6) on the building way at Union Iron Works, San Francisco, CA in October 1890. 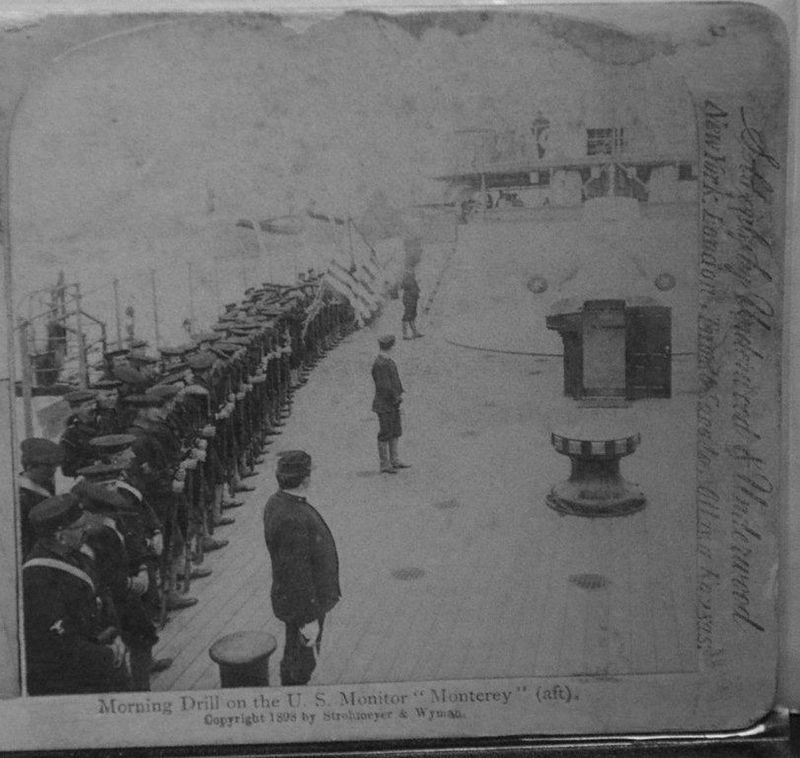 Photo found in "Report of the Secretary of the Navy, 1890". USN photo courtesy of Darryl L. Baker. 577k Article from "Report of the Secretary of the Navy, 1890" covering the changes in armament for the Monterey (BM-6). USN photo courtesy of Darryl L. Baker. 5.35k A HUGE COAST DEFENSE VESSEL. The latest of the marine engines of war will be on the model of the Monterey (BM-6), all its features, however, being heavier than anything yet floated, at least in the American navy. Image and text provided by University of California, Riverside. Photo courtesy of The Morning Call. (San Francisco [Calif.]) 1878-1895, 11 January 1891, Image 12, via chroniclingamerica.loc.gov. 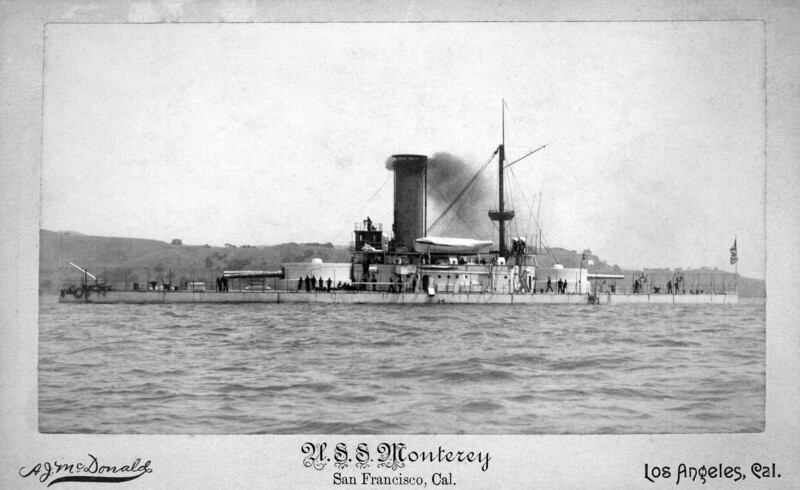 894k A McDonald photo of Monterey (BM-6), circa 1893. Photo from the files of the Vallejo Naval and Historical Museum, courtesy of Darryl L. Baker. 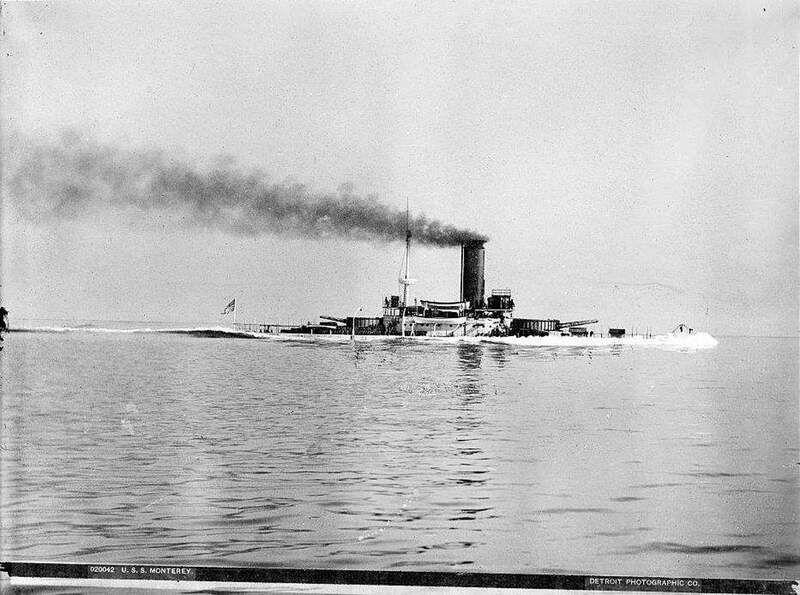 168k Starboard broadside of the Monterey (BM-6) underway sometime between 1893 and 1901 at an unknown location. Library of Congress photo # LC-D4-20042, courtesy of Mike Green. 739k Monterey (BM-6) in berth at Mare Island Navy Yard in 1895. The yard's coal sheds are in the background. Other ships are not identified. USN photo courtesy of Darryl L. Baker. NR STEEL UNITED STATES COAST DEFENSE VESSEL MONITOR TYPE MONTEREY (BM-6) Image and text provided by University of North Texas; Denton, TX. Photo courtesy of The Bryan Daily Eagle. (Bryan, Tex.) 1895-1898, 04 February 1896, Image 2, via chroniclingamerica.loc.gov. 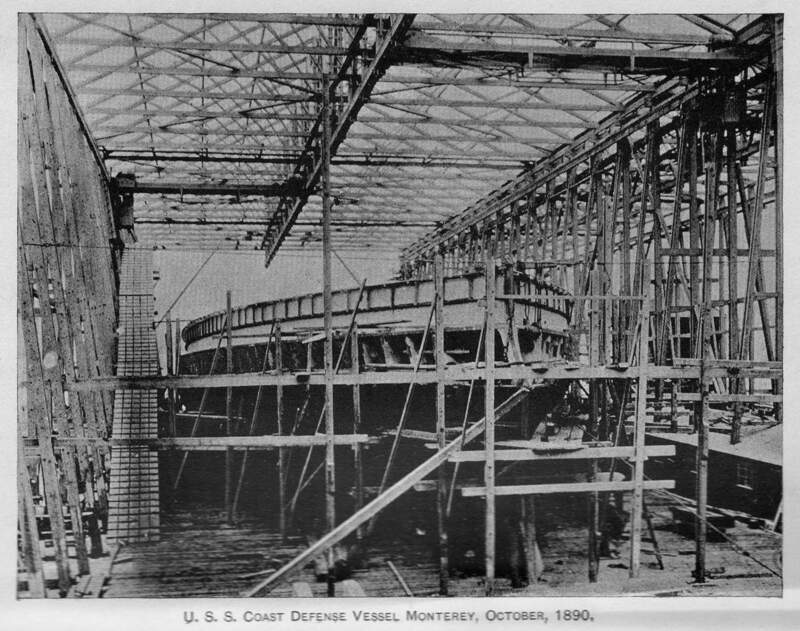 45k Monterey (BM-6) in dry dock, 22 April 1896. 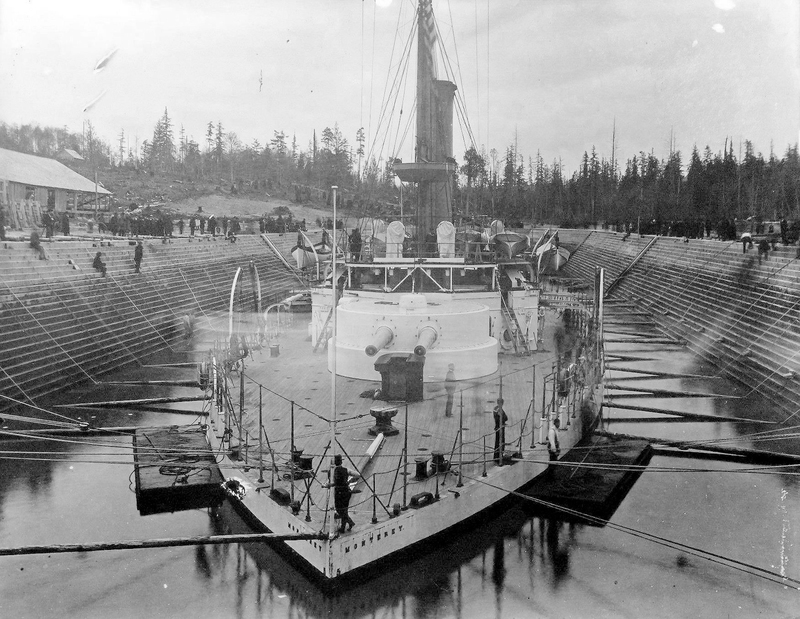 She was the first ship to use the graving dock at what is now Puget Sound Navy Yard, Bremerton, Wash. The ram bow and full body, characteristic of the "New Navy" monitors, can be seen. Photo & text courtesy of "Monitors of the U.S. Navy, 1861-1937", pg 5, by Lt. Richard H. Webber, USNR-R. (LOC) Library of Congress, Catalog Card No. 77-603596. 104k Monterey (BM-6) at target practice off Port Angeles, Wash. 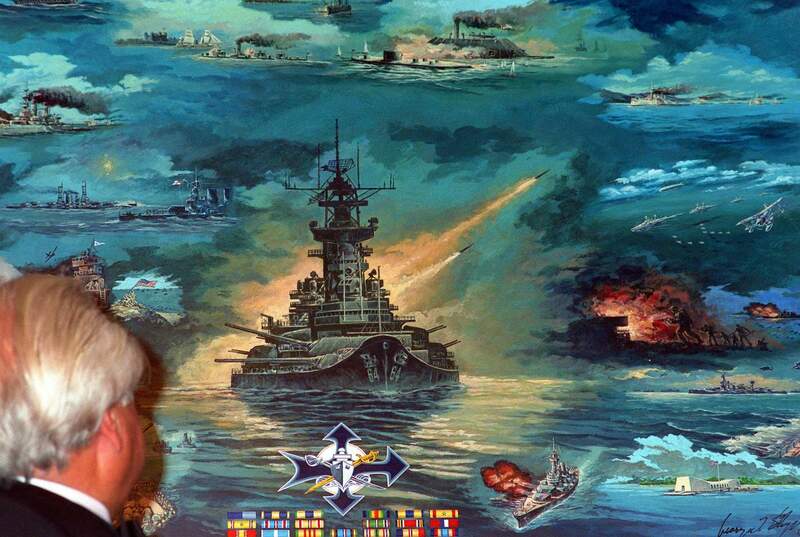 The splash of one of her 12-inch shells may be seen in the right background. Photo & text courtesy of "Monitors of the U.S. Navy, 1861-1937", pg 6, by Lt. Richard H. Webber, USNR-R. (LOC) Library of Congress, Catalog Card No. 77-603596. 36k Outboard profile of the Monterey (BM-6). Photo & text courtesy of "Monitors of the U.S. Navy, 1861-1937", pg 43, by Lt. Richard H. Webber, USNR-R. (LOC) Library of Congress, Catalog Card No. 77-603596. 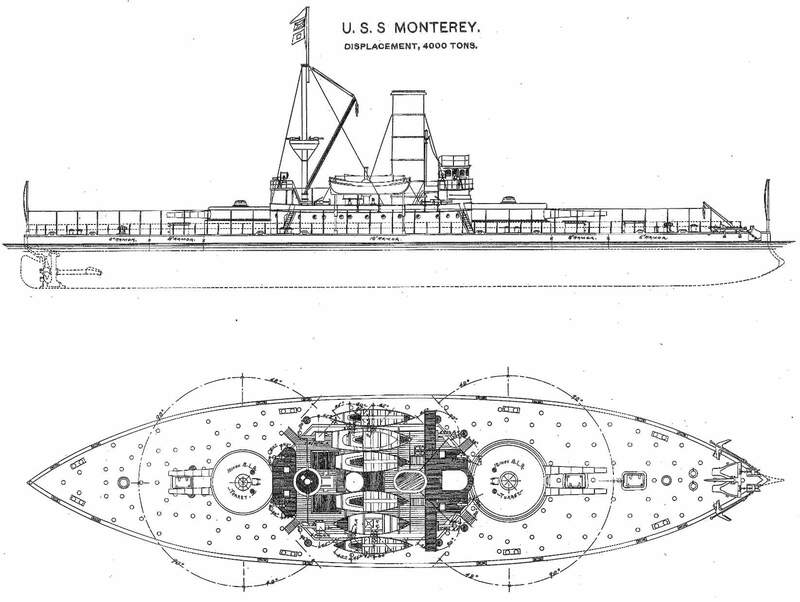 221k A line drawing of the monitor Monterey (BM-6) as completed. Photo courtesy of Transactions of the Society of Naval Architects and Marine Engineers, collection of Robb Jensen. 181k Monterey (BM-6) in berth at Mare Island Navy Yard in August 1897. She is south of the yard's coal sheds. USN photo courtesy of Darryl L. Baker. 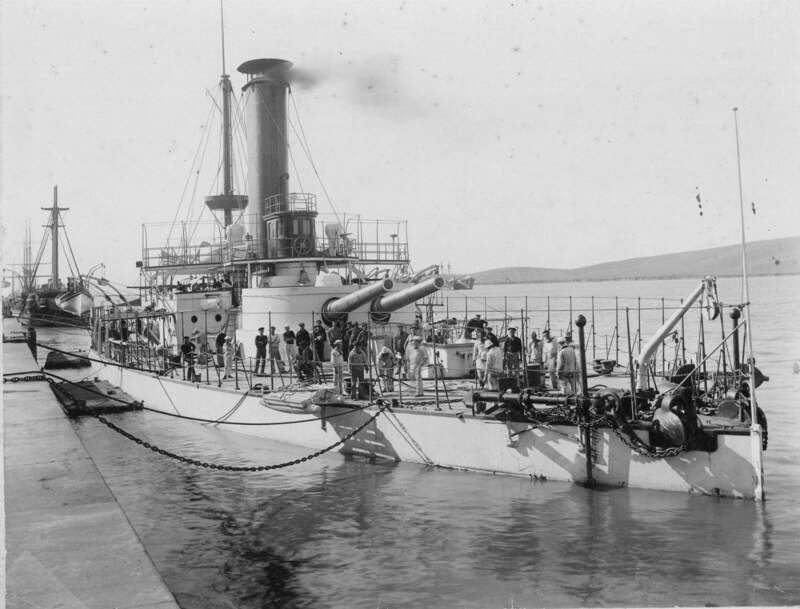 168k Broadside view of Monterey (BM-6) at Mare Island Navy Yard in August 1897. USN photo courtesy of Darryl L. Baker. 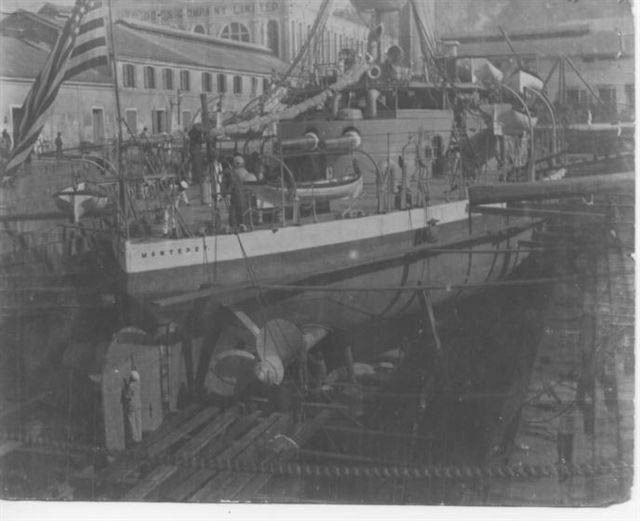 98k Monterey (BM-6) is seen in dry dock number 1 at Mare Island in 1898. USN photo courtesy of Darryl L. Baker. 1.26k Photo of Monterey (BM-6) in drydock & drawing of same minus the water. Photo courtesy of David Wright. Insert photo from the Scientific Amerian Magazine of 1898 Supplement, courtesy of David Upton. 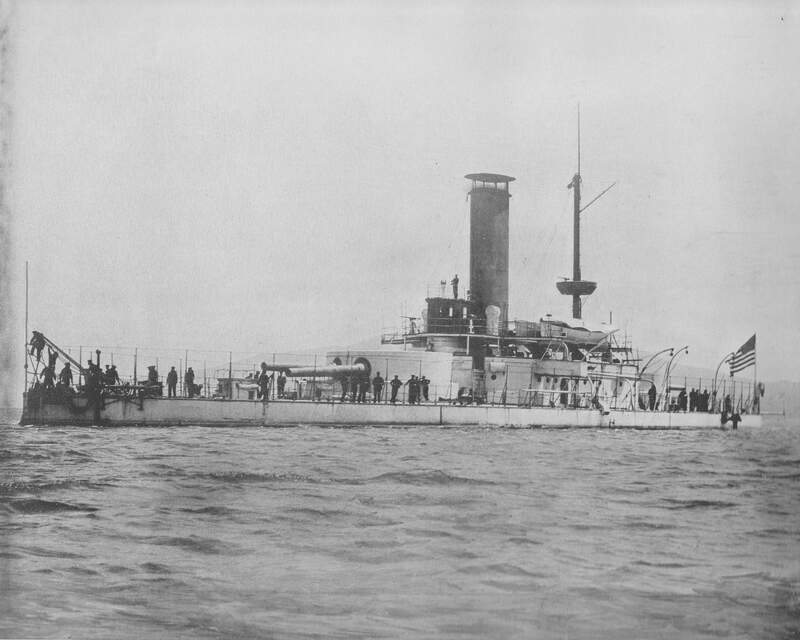 625k Morning drill on the Monterey (BM-6), aft, circa 1898. Photo courtesy of Tommy Trampp. 214k Officers of the Monterey (BM-6) (reinforcements for Dewey). 1898 Underwood Stereoview Photograph. Photo courtesy of Tommy Trampp. 75k Stern view of the Monterey (BM-6) in harbor with a steam launch coming alongside, probably at Mare Island. USNI / USN photo. Photo i.d. courtesy of Ed Cleary. 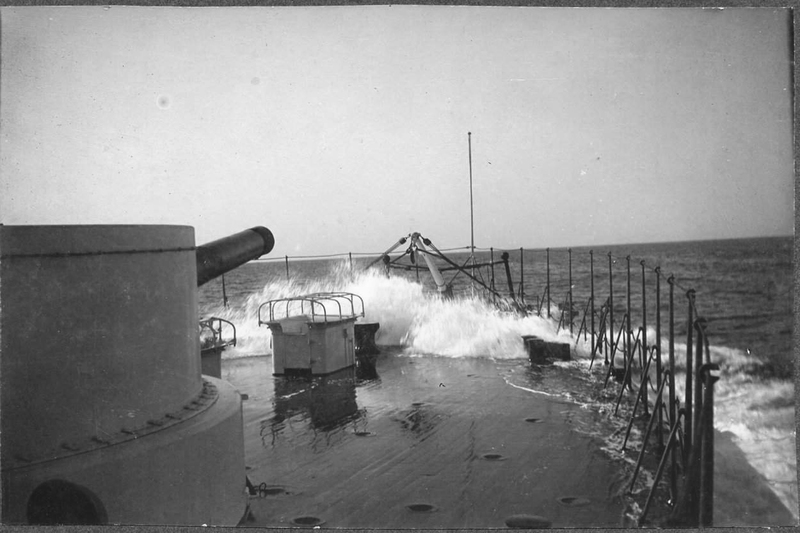 988k The forward turret of the Monterey (BM-6) is slightly depressed, circa 1898. Photo from The American Navy with Introduction and Descriptive Text - Reproductions of Photographs - Belford, Middlebrook & Co. - Chicago, 1898, submitted by Thomas Becher. NR WAR PAINT FOR THE MONITORS. Image and text provided by University of California, Riverside. Photo courtesy of The San Francisco Call. (San Francisco [Calif.]) 1895-1913, 23 April 1898, Image 5, via chroniclingamerica.loc.gov. NR Monterey (BM-6) Ordered to Join Dewey's Fleet. SOON TO BE SLIPPED ON THE SPANIARDS. 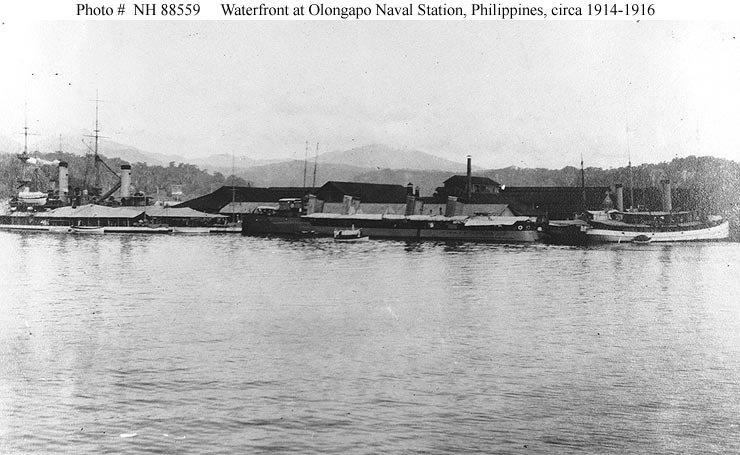 THE POWERFUL COAST-DEFENSE MONITOR MONTEREY, Ordered to Proceed to Manila to Re-enforce Admiral Dewey's Fleet. Image and text provided by University of California, Riverside. Photo courtesy of The San Francisco Call. (San Francisco [Calif.]) 1895-1913, 22 May 1898, Image 7, via chroniclingamerica.loc.gov. NR THE POWERFUL COAST DEFENSE MONITOR MONTEREY (BM-6), TO BE TOWED TO MANILA. Image and text provided by University of California, Riverside. Photo courtesy of The Herald. (Los Angeles [Calif.]) 1893-1900, 28 May 1898, Image 1, via chroniclingamerica.loc.gov. NR RUSHING THE CRUISER PHILADELPHIA (C-4) INTO COMMISSION. The monitor Monterey (BM-6) was in the drydock at the time the picture was taken, and her mast and fighting top can be seen above the top of the caisson. Image and text provided by University of California, Riverside. Photo courtesy of The San Francisco Call. (San Francisco [Calif.]) 1895-1913, 03 June 1898, Image 7, via chroniclingamerica.loc.gov. 2.58k THE MONTEREY (BM-6) WILL BE HARD TO HIT WHEN GOING INTO BATTLE. Image and text provided by Minnesota Historical Society; Saint Paul, MN. Photo courtesy of The Appeal. (Saint Paul, Minn.) 1889-19? ?, 04 June 1898, Image 2, via chroniclingamerica.loc.gov. 3.41k THE FLEET THAT WILL RUSH MEN TO REINFORCE DEWEY. Image and text provided by University of California, Riverside. Photo courtesy of The Herald. (Los Angeles [Calif.]) 1893-1900, 05 June 1898, Image 1 & The San Francisco Call. (San Francisco [Calif.]) 1895-1913, 19 June 1898, Image 22 via chroniclingamerica.loc.gov. The United States coast defense steamer Monterey (BM-6) and the coal ship Brutus sailed for Manila yesterday. It was expected that they would get away early in the morning, but the coils of the distiller were not put aboard as soon as expected, so it was 1:30 p.m. before the vessels departed. Passing along the front almost every steamer in the bay saluted them and all the flags were dipped in good-by. The first stop will be at Honolulu, where the Monterey will recoal. She will then probably proceed in tow of the Brutus or she may go along under her own steam and run in under the lee of one of the many islands on the way to Manila and recoal from the cargo in the hold of the Brutus. It is expected that the Monterey and Brutus will make the passage in about thirty days. Image and text provided by University of California, Riverside. The Powerful Monterey (BM-6) Which Will Reinforce Admiral Dewey's Fleet in the Philippines Image and text provided by Washington State Library; Olympia, WA. Photo courtesy of The Seattle Post-Intelligencer. (Seattle, Wash. Terr. [Wash.]) 1888-1914, 12 June 1898, Image 21, via chroniclingamerica.loc.gov. 469k Main deck is awash while Monterey (BM-6) is making a full power run, probably during her crossing of the Pacific in August of 1898 to join Dewey's fleet. USN photo courtesy of Darryl L. Baker. 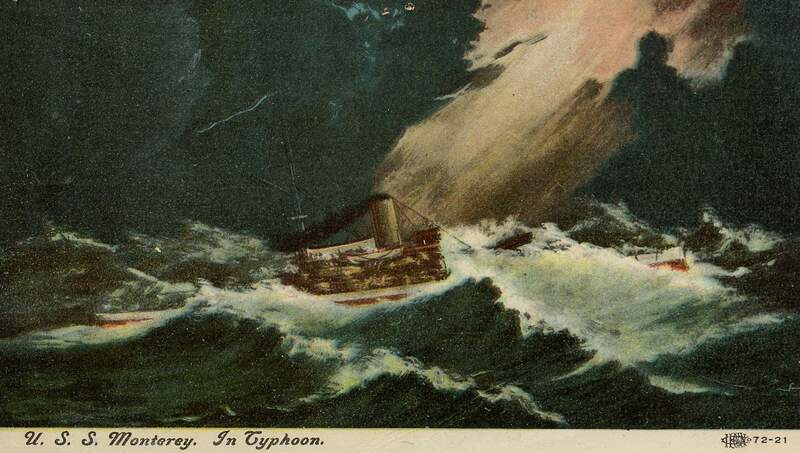 285k Post card of the Monterey (BM-6) underway during a typhoon, probably during her crossing of the Pacific in August of 1898 to join Dewey's fleet. USN photo courtesy of Darryl L. Baker. 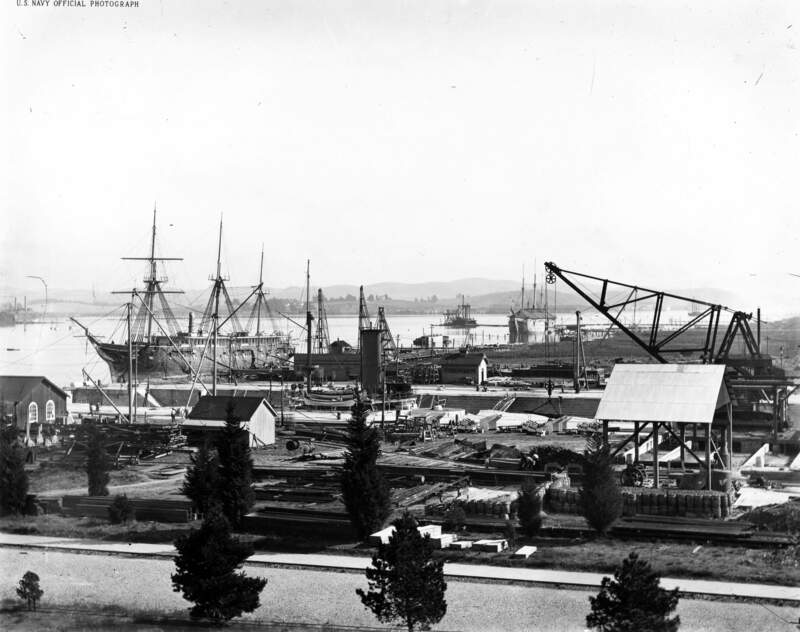 853k A photo of the southern section of Mare Island in November 1898. 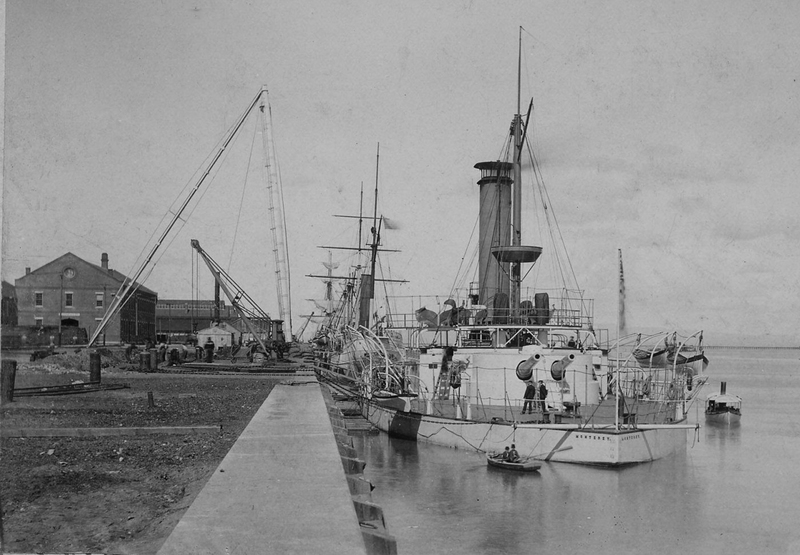 Ship at the quay wall (left) is Pensacola service as a training ship. The yard's receiving ship Independence is seen below the boom of the 40 ton dry dock rail crane. The Monterey (BM-6) is dry dock number 1. The shed below the 40 ton crane is the winch for the marine railway. USN photo courtesy of Darryl L. Baker. 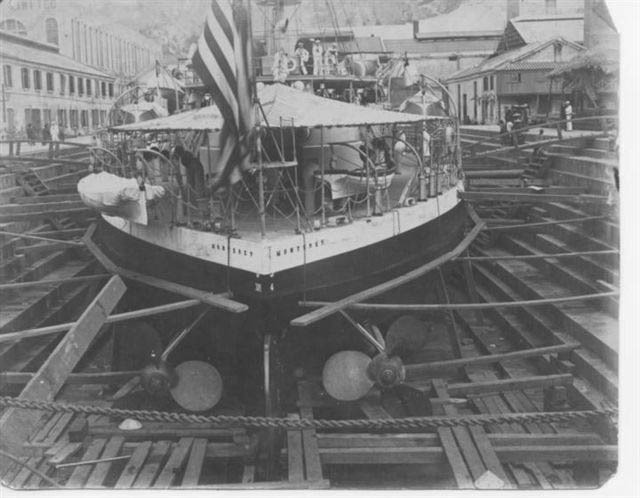 56k Stern view of the Monterey (BM-6) while in drydock, in China, circa 1900 - 1904. Photo from the collection of George Henry Snow, courtesy of Mark Kozak. 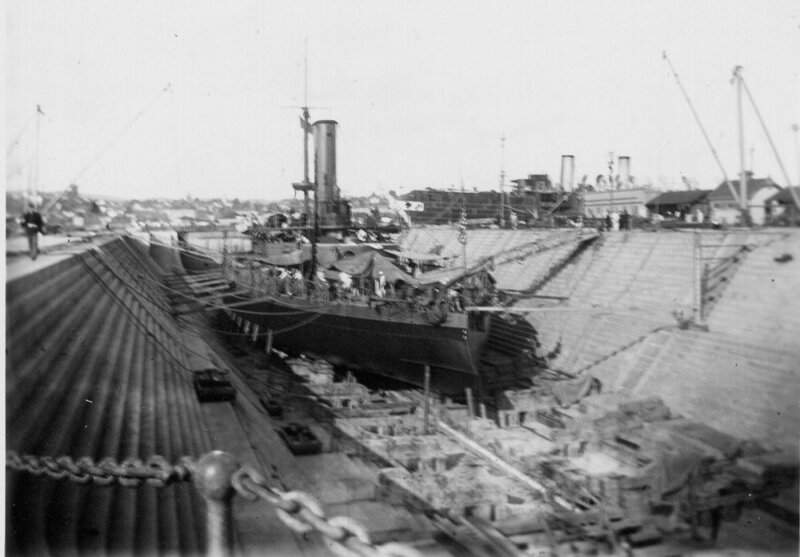 68k Stern view of the Monterey (BM-6) while in drydock, in China, circa 1900 - 1904. Photo was probably taken during the summer, note the awning covering her stern section. Photo from the collection of George Henry Snow, courtesy of Mark Kozak. 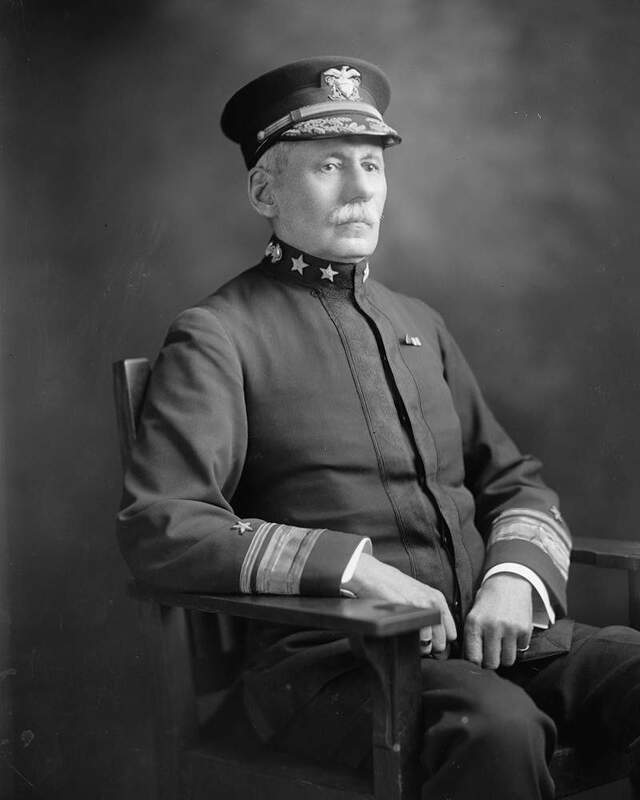 48k Captain Franklin Jeremiah Drake was the commanding officer of the Monterey (BM-6) from 1901 to 1903. His assignment was to cruise the Chinese coastline and sail up the Yang-tse River protecting American citizens and commercial interests of the United States. During Chinese New Year in January 1903, as senior officer, succeeded in suppressing, by prompt measures, an uprising of 5,000 armed rebels who had entered old Canton in disguise for the purpose of massacre the Viceroy and other Manchurian officials in power. Photo courtesy of the Library of Congress via Bill Gonyo. NR SHIPS SAN FRANCISCO HAS ADDED TO THE NAVY. Submarines: Pike (SS-6) and Grampus (SS-4). Image and text provided by University of California, Riverside. Photo from The San Francisco Call. (San Francisco [Calif.]) 1895-1913, 26 April 1908, Image 8, via chroniclingamerica.loc.gov. 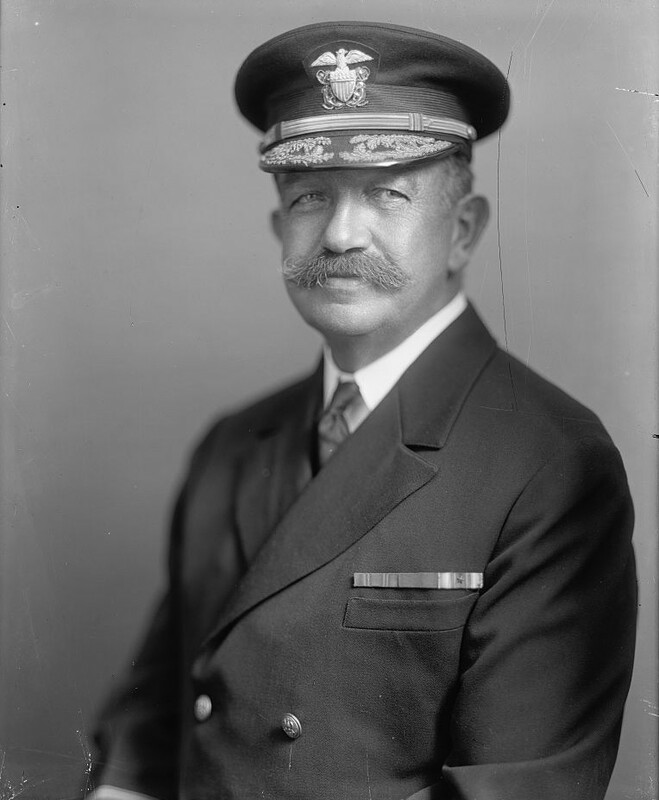 113k Commander Jehu Valentine Chase was the Commanding Officer of the Monterey (BM-6) from 1912 to 1913. Photo courtesy of the Library of Congress via Bill Gonyo. Pictured are the Indiana (BB-1), Iowa (BB-4) & Monterey (BM-6). Image and text provided by Oklahoma Historical Society. Photo courtesy of Farmers' Champion. (Elgin, Okla.) 1912-1922, 25 September 1913, Image 6, via chroniclingamerica.loc.gov. Took Monitor Monterey (BM-6) Across Pacific to Join Dewey in Manila Bay Image and text provided by Library of Congress, Washington, DC. Photo courtesy of Evening Star. [volume] (Washington, D.C.) 1854-1972, 04 May 1914, Image 3, via chroniclingamerica.loc.gov. Piscataqua (AT-49). USN photo # NH 88559 from the collections of the US Naval Historical Center. Collection of C.A. Shively, 1978. Photo courtesy of The Sunday Telegram. (Clarksburg, W. Va.) 1914-1927, 19 March 1916, THIRD SECTION, Image 27, via chroniclingamerica.loc.gov. All Pages �1996 - 2019, by Paul R. Yarnall NavSource Naval History. All Rights Reserved.